The recent news about the financial woes and audit of Rocky Mountain Human Services will hopefully not go unheeded to those who are interested in tipping the balance between the use of public dollars to the intended purpose and changing systems so that they support people with disabilities first, rather than the provider industry and lobby. The brochure was indeed better than the program. A multi-million shortfall exists as well as $679,000 overage in administrative fees from the mill levy fees paid by the kind citizens of Denver. A million dollar line of credit with a bank had to be renegotiated. Executive team compensation is now 45% less than six months ago; seventeen percent of the entire budget has been cut. All this after only a third of the total budget has been audited. Although the tale has many lessons and layers, a few are paramount. 1. At DIA, a traveler may hear the statement, “If you see something, say something.” Many advocates, families, journalists, staff members of the agency and others noted an environment of excess upon just entering the building, much less looking at the books and salaries. A parent of someone being served by RMHS once wrote a parody of waiting in the lounge of (then) Denver Options with thick carpet, multiple flavors of coffee offered by attractive staff, and beautiful pieces of art on the front of each door titled: “Self-Determination Room”, “Community Connections Room” and the “Person-Centered Room.” Excess was intuited easily by experience with the CEO, watching spending priorities, the exponential increase of the staff roster, and observing territorial greed. Profits Over People is a slogan often used with Wall Street financial excess and bonuses, but now it can be used in human services as well. Say something. 2. Next lesson is not only to say something when you see something, but to say it to the right people. The right people in this case are the true third party auditors, the district attorney and the press. The Board of Directors, the mill levy audit committee, and the staff were mostly neutered by the simple hierarchy and inattentive personalities. If your job is in jeopardy, do it anonymously. I noted issues in the Family Support program in 1994 and wrote a letter to the CEO himself who responded that my allegations were egregious. All my letter did was get $10,000 of restricted funds back into the Family Support line item; it did not block the practice from occurring again and again and did not save the millions that were lost in the interim years. I was a naïve advocate. In 2002 the DD Council took a list of the 990’s to the (then) CACCB trade association, now The Alliance, for discussion on the accuracy before we published it in our newsletter. Later, the same information was shared with the JBC. Again, right information, wrong places. Take the issue out of the traditional chain of complaint to an auditor. Lessons were learned the hard way–my apologies to those on the waiting list, those who are paid low wages for doing the most important work and to families and individuals with disabilities generally. 3. Learn the law of unintended/unanticipated consequences and memorize the phrase, “If you build a better maze, you get a smarter rat”. We knew there was great excess in administrative costs and a relish for discretionary funds or unrestricted funds. We lobbied for a 15% cap on admin fees, only to have the categories of what was admin and what was program changed. The rat just got smarter. There were many unanticipated actions as a result of the cap on administration. Excess continued. 4. Oversight cannot be based on personality. The use of public dollars cannot continue to be based simply on trust of the individual – be it the CEO or oversight committee members. 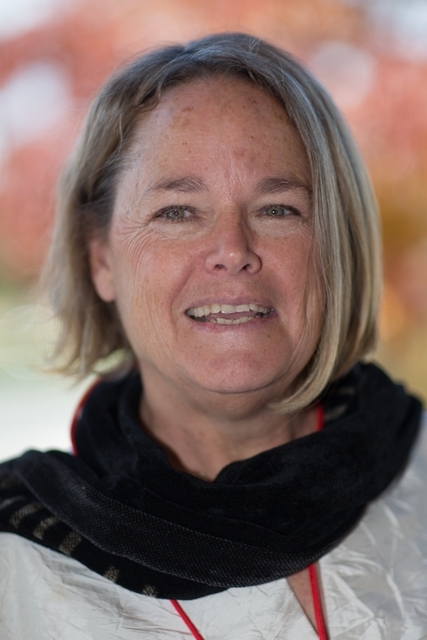 The RMHS interim director is doing her best to reign in the budget and keep the agency viable, but the public cannot rely on the implied ethics of an executive director. If a different personality comes in or if committee members/board members are appointed by a self-serving CEO, be assured that they are not true third party advocates. A strong skeleton of accountability needs to be in place internally and externally, personalities aside. Neither were in place with the mill levy funding and the auditor’s office luckily intervened in time to keep the agency viable. Lessons learned–but at a great loss to those we are here to serve. 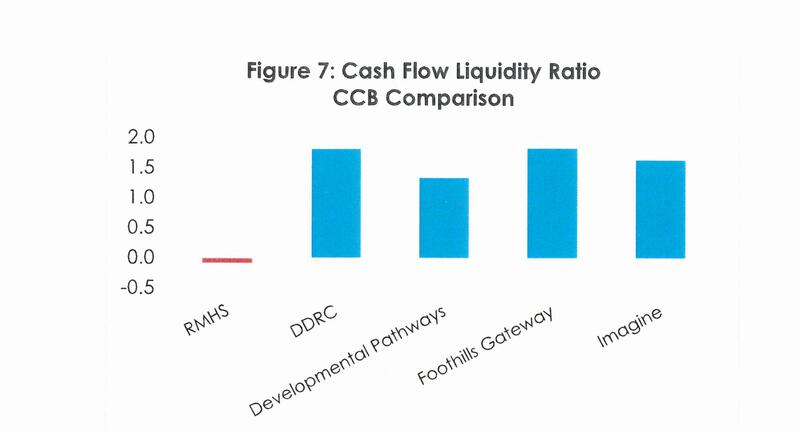 The first chart, “Figure 3: 2014 CCB Executive Pay” compares the salary of the Executive Director of Rocky Mountain Human Services and four other CCBs; the Auditors could not determine the funding source for the salary of RMHS’s ED. The second chart, “Figure 7: Cash Flow Liquidity Ratio CCB Comparison” compares five CCB’s debt ratio, related to borrowing patterns.